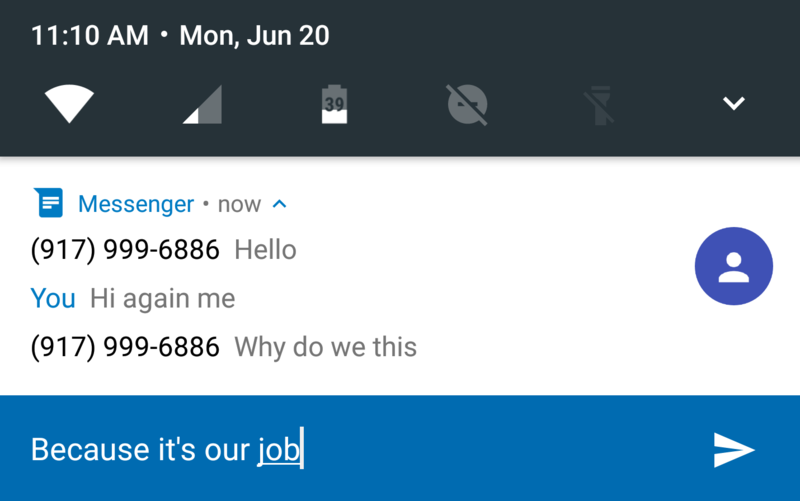 Direct reply is easily one of my favorite new features of Android N, and apps are actually being surprisingly quick to adopt it - Twitter and Facebook are already on board, along with Google Hangouts and Messenger. But the implementations we've seen to date are, in my opinion, a little less than optimal. When I first saw direct reply, my first thought was: "Oh, great - mini conversations I can just have in my notification bar - no need to open the app!" Which seems like what Google was going for, but that Hangouts and Messenger didn't really initially accomplish. You see, both apps allowed you to quickly reply to incoming messages on the fly, but that was really it. If you pulled the notification tray open to do this (as opposed to using the pop-over card), your reply would be sent, and the notification would close. You could see a list of recent incoming messages, but not your own outgoing ones. True conversation view: the expanded notification now shows both recent received and sent messages in a "mini" convo view, which is much more useful. The notification no longer auto-dismisses when you send a direct reply from the notification shade or the pop-over card. Again, this feature isn't technically specific to Developer Preview 4 and, as far as we know, has nothing to do with any changes to the OS - this is just a new direct reply implementation in the Messenger app that shipped with DP4. You can get the APK here (Android N+ required), but if your device is compatible with it, you probably already have it unless you're avoiding upgrading to N Preview 4 for some reason. Either way, I hope Hangouts and other apps adopt this superior direct reply implementation - this is what it should have been from the get go. According to Google Developer Advocate Ian Lake, this feature leverages the new "Messaging Style" API introduced in Android N.